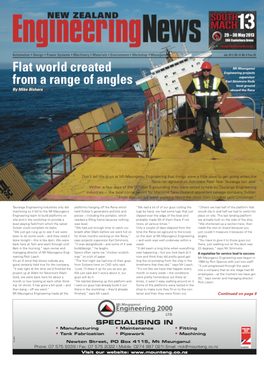 New Zealand Engineering News (NZEN) has been the industry’s journal of record since 1969. Every month it keeps its 37,810 readers in New Zealand abreast of the latest news, products and processes in an increasingly automated and diverse engineering industry. With design and manufacturing driven by CAD/CAM and robotics support, we make sure our readers are kept up to the minute with technical articles and case studies from New Zealand and overseas to provide models for development.The magazine prides itself on its editorial and content independence but recognises the importance of hands-on editorial input from engineering companies and support services. Advertisers in the company’s special features sections are entitled to receive professionally written or edited articles tailored to their needs but providing added value to readers.Every month, well marked sections of the magazine and the online edition will contain valuable insights into related areas such as training and safety programmes, recycling options and the increasing use of plastics and composites to maintain product strength and lose weight.The latest from the backbone of the engineering sectors like welding and CNC machinery are not left out in a rush to new ideas. The latest techniques and products around for steel and metals fabrication, foundry operations and materials and mechanical handling are well covered.In response to trade demand, NZEN introduces, this year, a dedicated section each month on management, banking and finance, recruitment and a monthly section on clean technologies, including preventative maintenance and waste management. All this provided by a team of professional journalists in all major centres around the country. 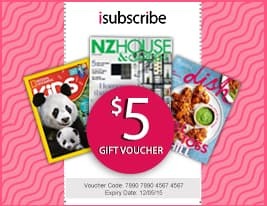 Be the first person to tell us what you think about NZ Engineering News and you'll save $5 on your next purchase!